The following updates are for Warframe Version 14. Increased default speed of Dagger attacks using the 尖锐之风 stance. Altered the Nikana jump roll transition time and animation to match the default roll. Increased the drop rate on Personal Life Support modules in Corpus and Infested Survival missions so as to match Grineer and Corrupted Survival drop rates. Parry procs can now be triggered during Valkyr’s Hysteria. Bonus Credits will no longer be awarded on failed missions. Bonus Credits will now be displayed at the end of match screen and back on the Liset for Dark Sector missions. Fixed an issue with the Codex Scanner overlay appearing even when no HUD was toggled, content creators rejoice! Fixed an issue with Valkyr’s Hysteria finisher animations using Furax animations. Fixed an issue with Loki being able to switch teleport Dark Sector defense pods. Fixed an issue with 移形换位 field of view visuals not properly disappearing if the ability is used while falling into a pit. Fixed cases of toggle abilities getting out of sync between host and client when spammed. Fixed an issue with the pause menu causing the extraction animation to not play correctly and subsequently cause the player to fail the mission. Fixed an issue with the incorrect wave number being displayed at the end of Defense missions. Fixed erroneous counter chance calculation. Fixed resource boosters doubling personal best score for Shifting Sands. Note: No earned rewards or personal best scores will be revoked! Tactical Alert will run until Tuesday the 14th at 12pm EDT. Reduced the amount of tile duplication seen in Forest and Settlement Excavation missions. Affinity bonuses will no longer be awarded on failed mission. Fixed an issue with Excavators not always appearing right away when entering the objective area during Excavation missions. Fixed an issue with Excavation sites being layered on top of each other during Excavation missions. Fixed an invite exploit that would allow players to enter Conclaves despite not having the proper level requirement. Fixed an issue with Conclave ratings not properly updating when equipping/unequipping mods. Fixed an issue with sale items in the Market not properly displaying the discount %. Fixed Ash’s Bladestorm being continually in use when casted while holding a power cell/datamass. Fixed players window repositioning upon changing in-game settings. Fixed Grineer Capture Target showing a Corpus model in Codex. Excavation missions have returned! Head to Earth or Phobos to play this new mission type where Survival missions used to be! 无明制裁: a new Nikana Stance has arrived! We detect Phobos may soon have a reason to get “Tactical”... stay tuned, Tenno. Changed the Sentinel “Sanctuary” mod: it now goes up to Rank 10 (600 total shield) and is now amplified by your Sentinel's Redirection mod. Global Chat channels will now be automatically rejoined if they were active before a player disconnection. Improved the loading screen performance which should resolve a large hitch seen at around 75% completion. Disable scaling of Dojo Teleporter decorations due to feedback on the fidelity of a scaled pad. This won't retroactively affect previously placed teleporters that were scaled. Improved the performance of numerous Gas City tilesets. Changed Critical Chance logic by allowing it to occur on Radial Explosions (both friendly and enemy where applicable). This fixes an issue with the Torid’s gas cloud not allowing for criticals. Fixed an issue with Alerts not being properly visible on the Solar Map after returning to the Liset from a previous mission. Fixed an issue with the Harlequin Mirage Helmet Blueprint incorrectly appearing as the Arcane Scorpion *Ash Helmet Blueprint. Please note that we will be re-running a functioning Harlequin Helmet alert at a similar time as the broken one, but with a doubled duration. Fixed an issue with players having a gray screen when returning to the Liset after a mission failure. Fixed an issue where players would receive PvP Excalibur Transmissions in Void Key missions. Fixed an issue with certain Aura Alert missions being uncompletable. Fixed an animation hitch seen when performing a forward roll with the Nikana equipped. Fixed shadow problems on the latest AMD drivers. Players affected would have seen large black squares where shadows would normal be cast. Fixed the Codex entries for the Grineer and Corpus capture targets. Unfortunately the fix required making two new entries so you will have to re-scan the Grineer target if you'd already completed the old broken codex entry. Fixed the Stalker taking shield damage during his intro and outro animation sequence. Fixed clients being able to damage the Stalker’s health during intro and outro animation sequences if there is a laggy host. Fixed several crashes based on submitted crash reports in the past 24 hours. Causes for these crashes include a DX9 related crash, a mouse handling crash, corrupt caches, and many many more. Fixed case where NAT-PMP would fail to respect the protocol and may not have functioned, resulting in connectivity issues. Added HUD indicator for Iron Skin (displays percentage remaining). Fixed Latron Wraith and Prime weapons appearing in list of eligible components when crafting the Tiberon rifle. Fixed intermittent chat server disconnects. Fixed Grineer Caches appearing in missions on Earth. Fixed Kubrows performing "struggle" attacks on Lephantis. Fixed clients being able to pause gameplay if they had their matchmaking mode set to Solo and then joined a mission via friends list/invite. Fixed muzzle flashes not appearing in correct location when aiming through sniper rifle scopes. Fixed Loki Enigma profile icon packs giving players a Locust Ash profile icon instead – we believe this was an organized prank by our stealthy frames. - - These have now been retroactively fixed in a script. Log out and in to receive please. FYI confirmed Nova Slipstream has same issue, a script has been run to retroactively fix. Hotfix will come to fix store shortly. The Tiberon! Forged by a master gunsmith, this burst action rifle will take down the most fearsome foes! Nova’s Slipstream and Loki’s Enigma alt helmets are here! Capitalized Aura names in the squad panel loadout for consistency. Improved performance on the visual effects of Vauban’s Bastille for longer durations in an effort to reduce crashes. Removed the [Satisfied Grunt] subtitle from the tutorial. Made improvements to host/client loading screen wait times. Fixed player Alias’s being 1 pixel offset on the y-axis from its corresponding message. Fixed the chat window closing the wrong tab when closing a tab through the right click context menu. Fixed chat getting the wrong user when right clicking on a private conversation tab. Fixed an issue where Alerts could disappear from the Solar chart after returning from missions. Fixed an issue with a large hitch that could occur when accessing the Codex or mods screen. Fixed an issue with Sonar’s energy colour not appearing correctly if player cast as Client. Fixed an issue where a player’s Kubrow performing finisher on Jackal could cause the Jackal to cease operations. Fixed an issue with Kubrow size discrepancies between host and client. Fixed Frost's Snowglobe countdown timer not going away if the shield is destroyed from damage. Fixed Melee channeling mods having a much higher penalty to channeling efficiency for Clients. Fixed Mirage’s Prism lasers not targeting Orokin Drones. Fixed an issue in the Dojo where players are told to build a Grand Hall despite Great Hall being the next Hall in order. Fixed Mirage’s Prism saying it used 100 power to activate when it only uses 50. Fixed cases of Mirage’s Prism lasting forever/not using any energy, and being able to launch a second Prism. Fixed Mirage’s Prism prematurely detonating if it hits a defense target. Fixed an issue where players could not leave or finish Interception or Defense missions if the Grustrag Three appeared. Fixed issue where swapping shoulders with the Buzlok resulted in the projectile embedding to the right of the reticule, where the unswapped reticule was aiming. Fixed Corpus security cameras sometimes being blind to a Mirage with Eclipse active. Fixed event inbox message saying BAYLOR Fomorians instead of BALOR Fomorians. Fixes reported cases of clients not being able to damage enemies caught in Vortex when using the Ogris, Torid, etc. Fixed script error with Smite in PvP. Fixed an issue with the weekly kill leaderboards not always reflecting the correct field. Fixed an issue where the Mutalist Quanta could be completely reloaded at the start of the animation, the animation must now complete before all ammo is reloaded. Fixed some melee weapons not dealing finisher damager after you switch from a different melee weapon (e.g. Hysteria ending). Fixed an issue where players wouldn’t get the AOE blast when reviving if they were using a Noble/Agile animation set. Fixed issue where the Liset bridge may not lower if you used the quick access menu between locations. Fixed issues with the Mirage Codex/Quest diorama having the wrong or conflicting Warframe presented. Fixed an issue with the Jat Kittag Ground Slam sometimes killing bosses depending on what the boss lands on. Fixed continued issues with pause not working in Solo missions. Fixed issues with host migration causing issues in the Conclave if a player was in a bleed-out state. Gate Crash trophies have been added and will soon be distributed to eligible clans! Trophies are live! We will update this thread when the statues have been sent out. Added Nyx Prime to the Codex (in place of ol' goldless Nyx). Added audio cues to the Buzlok homing mechanism for when a ‘lock’ is initiated and a ‘lock’ is lost. Toxic Crawler now creates a poison cloud on death, as per his description. Visual Effects tweak to the Glaxion: Ambient fog added! Buzlok homing beacon hit effect updated to not cause blood/shield visual effects as it does no damage, therefore no effects need exist. Continued improvements for Infested AI getting stuck under the cryopod in Infested Ship Defense which prevents the player from being able to kill the AI and continue on to the next wave. Polished the environment of Grineer Rescue 2.0 missions. Fixed an issue with the Hikou Prime having incorrect colouring when trying to customize energy colour (https://forums.warframe.com/index.php?/topic/314459-hikou-prime-colouring-bug/). Fixed issues with spawning logic of the Grustrag Three that could prevent them from appearing on Defense and Interception missions. Fixed continued issue where Stalker and other minibosses could appear during the claim reward/continue screen in Defense and Interception missions. Fixed an issue where Vay Hek would become invulnerable during the boss fight. Fixed the poison visual effect not appearing correctly on the Scindo Prime. Fixed an issue with the Hikou Prime sound effect being unaffected by volume sliders. Additional tweaks to overall sound levels are included in this hotfix. Fixed issues with elemental visual effects on the Sheev. Fixed issue with impassable black walls on Grineer Asteroid Rescue missions. Fixed issues with Vala Sugatra Prime not showing player energy colour. Fixed prices showing incorrectly/missing in the Market. Added in missing idle animations for Loki, Mirage, and Nova (noble). When inactive for a few seconds, each of these frames will now have idles! Corpus Ship: Mars - Vallis and Nereid - Neptune. Grineer Asteroid: Sedna - Jengu, Phobos - Gulliver, Saturn - Numa, Uranus - Mab. Grineer Galleon: Saturn - Anthe, Uranus - Caliban, Sedna - Naga, Sedna - Veles. Difficulty rebalancing also occurred for these nodes. Fixed issue with the Kronen and Silva & Aegis both not having a proper wall attack. Fixed Energy Vampire making clients think they have been given 2x the energy they should've received, when they actually got the proper amount. Fixed crash that would occur if you shutdown the game immediately after hitting abort mission. Fixed issue with Oberon’s Smite not being able to target Orokin Shield Drone. Fixed an issue where Orokin Shield Drones would rotate onto their sides when shot by the Nukor. Fixed Vauban's Bastille slowly deteriorating frame-rate each time it was cast. Thanks to Test Clan Please Ignore for helping isolate the problem. Fixed buffs not being applied correctly to weapons with damage falloff (i.e. Shotguns). Fixes amount of damage dealt at the extent of the weapon's range. Before, damage dealt at maximum falloff range was not considering Mods like Blaze and Point Blank. After, it will now consider these mod buffs in the damage value at maximum falloff range. Fixed extra Lotus transmissions playing/repeating after bleeding out and switching to spectator mode. Fixed multi-shot mods causing Buzlok to fire an extra homing beacon. Fixed Buzlok's homing beacon firing from wrong position when using scope sights. Fixed Atterax not animating when viewed in the arsenal. Fixed Vor being susceptible to Mind Control when encountered in Void T4 missions. Fixed incorrect backdrop appearing in opening cinematic when launching Gate Crash mission. Fixed instances of blue steam jets that were appearing in some Derelict rooms. Fixed Team Health Restores not functioning properly when deployed on a moving object. Fixed Vauban's Bounce and Vortex appearing with default energy colour for clients. Fixed some missing Bounce FX on clients. Optimized visual effects on Vauban's Tesla grenades for lower end hardware. Fixed enemy bodies contorting when killed inside/near Void Portal in Gate Crash missions. Fixed objects from adjacent rooms protruding through walls in Gate Crash/Orokin Derelict tileset. Fixed Operation: Gate Crash exploit where Dethcube's Vaporize would continue to deal damage when you should be completely impotent. Increased attack speed of Sheev. To be continued, looks to have just been slide speed. Polish and audio tweaks to Gate Crash event. Fixed Operation: Gate Crash progression stopper when trying to go through a portal after finding any Grineer Caches. Fixed an issue where Sprag and Venk'ra could get stuck in a pit on Phobos, making the mission unbeatable. Fixed issue with Defense missions dynamic music not working properly. Fixed issue with enemy AI freezing when trying to 'pull' a Mirage Hall of Mirror clone. Fixed issues with client fire accuracy on the Buzlok. Buzlok Homing Beacon is now a silent projectile. Introduced damage scaling for Sprag and Ven'kra's charge & melee attacks; amount of damage dealt is now in line with enemy levels for the selected mission. Energy colour is now customizable on the Rakta Syandana. Increased the size of the Gate Crash badge by 17% (Bigger badge ahoy). Made several audio tweaks to Atterax, the Liset engine and Sprag & Ven'kra. Adjusted equipped position of Buzlok. Fixed Gate Crash extraction room activating before Torsion Beam Device had been destroyed. Fixed an issue where Atterax would continue to spin/play idle sounds while on the players back if it was interrupted when using quick melee. Fixed several crashes and game freezes. Fixed an issue where Buzlok can cause player to do diving jump animation when not zoomed in. Fixed an issue with Sprag and Ven'kra transmission portraits not having proper colours. Fixed an issue with Void portal sound becoming choppy at low FPS. Fixed a Buzlok issue where beacons would not always destroy when target died. Fixed the Buzlok homing beacon not replicating properly on Client. Fixed blue "team mate glow" persisting for unobstructed players, also fixes glow applying to player after reviving. Fixed filepath appearing in UI when receiving invitations to Gate Crash mission. Fixed unranked fusion cores being awarded from Grineer Caches. Fixed an issue with Gate Crash portal effects being incorrect on Clients. Fixed issue with overlapping minimap and navigation confusion in the Gate Crash event tileset. Fixed issue in Vor’s Prize where the objective marker would not appear in tutorial when reaching Vor. Fixed issue with new inline PM option not saving. Fixed UI issue where additional and unfunctional Stasis Slots were appearing in player’s Genetic Foundry. Fixed issues with several filepaths being displayed instead of subtitles. Fixed players always receiving Grineer Cache item/reward when completing a Gate Crash mission. Fixed large meshes sticking into the void which overlapped with other rooms. Fixed potential issue with loading into Fomorian Missions instead of event. Fixed game freeze/crash that would occur at end of mission if a Sentinel or Kubrow is killed during the mission. September 17th, 2014 官方论坛更新帖 - Operation Gate Crash! Keep Grineer out of the Void! We have reviewed Baro Ki’ Teer’s Archwing Datamass, much of it is corrupt but what little it does reveal is invaluable. We now know that more information exists and we must look for it in Orokin Derelicts locked in the Void. Our mission is urgent. The Grineer have also learned about the Archwing Technology and they are determined to destroy all traces of it before we find it. To do this, Vay Hek is using Void Keys and Torsion Beam Generators to force open Orokin portals. We must destroy his access to these portals. Our ability to recover Archwing fragments depends on it. Careful, Tenno. Vay Hek is using unstable keys. Cumulative exposure to the keys will have detrimental effects on your health, shields and Warframe abilities. Proceed accordingly. Start the event node on Earth. Play through the mission, defeat the Grineer bosses and destroy the Void Portal Key. If you want to take the risk, search out resource caches to find high-value items. Exposure to the Void Portal will begin to affect you. Exposure weakens your Warframe. The effects are cumulative – the more missions you run, the weaker you become. Each mission run you will earn 1 Exposure point. More Exposure points earned = higher Rewards. Earn 5 Exposure points on a node to unlock a new node. Nodes to unlock (in order): Phobos, Ceres, Challenge Node located back on Phobos. The Challenge Node has no Exposure point cap. Keep earning Exposure points for as long as you are capable --- know that your Warfame will be in an extremely weakened state the further you progress. This Operation is on now until Wednesday, September 24 at 12 PM EDT. 15 Exposure points: Sheev Dagger: Built for close combat, the Sheev's plasma blade slices through flesh and armor with equal ease. The top 3 Clans per Clan Tier will receive Gold, Silver, and Bronze Trophies. Clan Leaderboards: A Clan’s score is the sum of its members’ scores. Please be aware that people joining clans after the event has started will not contribute to their new clans score. New Buzlok! An advanced Grineer Rifle equipped with specialized homing rounds, always capable of finding their mark. New Atterax! A vicious Grineer whip adept at flaying skin from bone. In extreme cases disobedient Grineer have been sentenced to death by Atterax. Ongoing UI polish including more minor alignment, navigation tweaks, and market ease of life alterations. Added consistency in menus, including a reskin of the Inbox menu. Added in a new "Inline Private Messages" Chat option. Enabling this option will allow PM's to be displayed in your Squad and Clan chat. New Orokin Sabotage tilesets! As part of Operation: Gate Crash, these new hybrid maps will combine the Void with various locations throughout the Solar System. New Dojo Teleporter Decorations! Starting today, you can now place teleport beacons in your Dojo! These are decorations that can be named & dropped in the Dojo by those with necessary permissions. When you engage one you will get a list of all other beacons in the Dojo and you can teleport between them! Reduced weapon choices from 3 per group to 2 per group. Relit tutorial and swapped skybox and effects for a more polished appearance. Reduced Warframe’s power set to just First ability for the tutorial. Disabled Local Reflections and High Dynamic Range on certain Direct X9 enabled video cards which do not properly support these features. The "Get to Extraction" message will now play when Survival Alert timers hit 0. Also ensured that the "Operation has succeeded" transmission plays before the "Extraction is now ready" message. PvP Change: Ash’s Bladestorm reduced to 0.25 damage multiplier from 0.5. Further improved the aiming of Mirage's Prism projectile. Energy Vampire will no longer provide energy to Banshees performing Sound Quake so as to prevent infinite energy usage. Improved the damage number font to ensure sharper looking damage numbers when scaled up. Improved the loading performance of the Kubrow customization menus. Improved the performance of Mirage's Prism and Nova's Wormhole ability. Improved procedural level generation to fix several issues with AI behaviour that was frequently reported in Void Survival missions. These improvements and fixes will resolve issues where you may see door frames poking through adjacent tiles, superfluous connectors going nowhere, and other level issues caused by procedural generation. Additional improvements to prevent slow Clients from holding an entire squad on loading screen. Improved visibility for Clan/Alliance invites by treating all of these invites as high-priority, which will be seen at login. Disabled ally blue glow while in the Dojo with other Tenno. Fixed an issue with the background being displayed incorrectly on the Extractor selection screen. Fixed an issue with Stalker related blueprints not appearing at the end of match screen correctly. Fixed a crash related to quickly joining the same Dojo twice. Fixed numerous crashes and squad formation issues. Fixed an issue with the Cancel button on the Solar Map not working correctly. Fixed an issue with weapon attachments obstructing text in the Pause menu and in the body of Inbox messages. Fixed an issue with profane words being able to be used as Clan names. Fixed an issue with the Savior of Earth achievement not unlocking properly after beating Vay Hek. Fixed an issue with the Drone Explosion sound effect not playing properly from the area where the Drone was destroyed. Fixed Mirage's Prism not being properly castable by AI. Fixed a number of map holes in the Shipyards Sabotage tileset. Fixed an issue with text in the Arsenal overlapping when equipping a new weapon to an empty slot. Fixed an issue with players being blocked from unlocking Solar Map nodes by Dark Sector nodes which do not have a Solar Rail currently deployed on them. Fixed an issue with players being able to claim Defense mission rewards without actually extracting. Fixed issues with loadouts hanging briefly as helmets, skins, and other customizations are loaded. Fixed issue where players were unable to use Void Keys as recipe ingredients if you only had one type of a given key. Fixed an issue where enemies caught in Vauban’s Vortex will oscillate and vibrate in an unappealing way. Fixed issue where Melee weapons (like the Galatine with an attachment) and attachments would obstruct the UI. Fixed issue with Trinity’s Blessing fully restores the health of the Fomorian power core in Hijack missions. Fixed issue where Ash could Bladestorm targets at panels in Interception missions, rendering them ignored by future enemy AI. Fixed an issue in the Market regarding proper classification of Kubrow starter kits and color bundles. Added Rank display to item browsing, meaning you can now see what rank your gear is in the inventory. As an example, in the scenario of building an Aklex and you have three, one which is Rank 30, you can now see the item's rank in this new display! Unlisted 14.6.0 change: There is now a Dojo chat tab when in the Dojo! Trinity's Blessing is now recastable while passive damage reduction is active. This means you no longer need to wait for your Duration timers to expire before being able to recast Blessing. Dev observed and experienced the uninhibited blinding effect in up to a 60 M Range with several environments coming between Excalibur and targets. This prompted review. Secondly, the 14.6.0 changes have all been reverted as they were experimental and not intended to function in the way they did for this brief 12 hour window. Thirdly, what you can expect down the road is Radial Blind functioning in a way that considers Line-of-sight. The 14.6.0 unintended version suffered from a lot of problems with this approach, and coming will be radically improved line-of-sight checks for Radial Blind. Targets behind cover that can still see Excalibur are blinded. Other bodies won’t inhibit their blindness, but walls will. This Mod was originally fixed to not give a player energy for damage that was never dealt to player. When we added the damage predeath state in Conclaves, etc, the original fix was unintentionally reverted. The 14.6.0 fix resolves issues where Rage + Quick Thinking gave effective permanent invulnerability because energy was being added to pool that was never dealt to player. With this change in mind, the combination of Rage and Quick Thinking may seem less efficient as before due to no longer giving effective invulnerability. The scope of this change is being monitored to ensure the usefulness of these Mods as a combination. Changed loading screen/matchmaking logic to move on if after 10 seconds Client is unable to properly join/connect. Elaboration: Fixes entire squad being stuck on loading screen while waiting for low end PC to load. Changed the attack ferocity of Corpus Mine Osprey: before no maximum existed on number of deployed mines, and now there is a maximum of 6. Removed Kubrow roaming in Liset until further notice. Tweaked performance of Local Reflections code on Dx10 and Dx11 to address potential FPS loss. Reduced maximum number of attacks to [2, 3, 4, 5] to address issues with players getting stuck in Bladestorm-ed state for up to 15+ hits. Increased the PvP damage multiplier from 0.1 per hit to 0.5 per hit in an effort to keep damage output in line with previous values. Fixed issue with Captain Vor being unbeatable on Mercury. Fixed an issue with Nova’s Molecular Prime explosions caused by self-destructing enemies damaging teammates and defense objectives. Fixed issues with users connecting behind proxies being unable to update the game. Fixed an issue where Lotus would constantly talk to you at the end of Survival Alerts. Fixed a game freeze that would occur when attempting to fuse or change mods. Fixed game freeze when focusing on the categories menu after opening the item browsing screen in Foundry. Fixed interception console ‘hitswitch’ pushing AI through the terrain on Grineer maps. Fixed navigation issues that prevented faithful Kubrow from joining in the fight against Lephantis. Fixed issues with Void missions not pausing when playing Solo and hitting ESC. Harkonar Armor Set: This prototype Grineer Exo-Armor was destined to be worn by Grineer generals until it was stolen and repurposed by Tenno agents. Wear it as a sign of defiance. Added clarity to Alert Survival missions: A 10 minute countdown clock will now be displayed during any Survival Alert missions, indicating the mission requires a full 10 minutes of Survival to be completed. Added in the Ice Planet Trophy for those that have earned this Dojo decoration from Operation Cryotic Front! These have been given in a script - relog to check for your Decoration if you are eligible to receive! A new dissolve effect has been added for dead Kubrows. Added in a new volume slider for Ordis. Oberon’s Renewal now has a timer that displayed the current number of targets being healed. Oberon’s Hallowed Ground now has an ability timer. Kubrow and equipped Auras will now be displayed when hovering a squad members information. Added in continued UI polish in the form of alignment and navigation tweaks (some by just 6 pixels). Mods screen now shows the stat increases that will occur when ranking up Warframe abilities and Stances. See here for example of this addition. Added in a new "PC Type" detection for host election purposes. Laptops will get a small penalty equivalent to 150ms of ping so as to select the best host possible. Added in a "Please Wait" message that will lock the player in place when installing a module on your Liset during Vor’s Prize/elsewhere. Altered the ‘Defrag’ message seen on the Launcher to ‘Optimize’ for added clarity on its function. Moved “Decisive Judgement” Stance Mods from Specters to Grineer Wardens, found in Rescue 2.0! World on Fire was removed from *Grineer Warden’s for this change. Improved the aiming direction of Mirage's Prism ability. Improved the performance of a number of default customizations in the Arsenal. Improved the DX9 system performance of computers utilizing AMD Radeon X1xxx series video cards. Improved the network performance of numerous Warframe Abilities. Tweaked the sound of the Raska Howl ability. Improved the visual effects seen on Frozen enemies. Reduced the maximum amount of Ancients that can be simultaneously active during Infested Defense and Survival missions. Improved the XP bar full sound effect. Tweaked the sound effects of the Nukor pistol. Oberon's Hallowed Ground ability placement has been shifted backward slightly so as to allow for the casting Oberon to receive the full buff and removal/immunity effects. Increased the proc chance of the Glaxion. Limited the maximum amount Glaxion firing sound effects. Crawlers dropped by Infested Drones will no longer count towards Extermination enemy counts. Tweaked the pipe burst sound effect heard in Infested Corpus tilesets. .
Trinity's Blessing now heals 40/50/75/80% health and shields based on Mod rank. The percentage can also be increased by strength mods. Oberon's Renewal now directly affects Sentinels & Kubrows. Nova’s Wormhole can now support multiple Wormholes (1/2/3/4) depending on the level of the ability. Improved the performance of the Nukor on low end computers. Tweaked the Fusion visual effects. Fixed an issue with Cryopods in Galleon Defense missions appearing incorrectly after a host migration has occurred. Fixed an issue with Trinity's Blessing affecting Excavators. Fixed an issue with Derelict Vaults sometimes including no enemy spawns. Fixed an issue with player's being unable to start key missions in Solo mode. Fixed an issue with Alerts/Invasions/Nightmare nodes disappearing when returning from a mission. Fixed an issue with the Friend's and Clan screens not properly displaying the correct amount of players in a session. Fixed an issue with the Coolant Leak visual effect appearing for allies and the player after a Radiation proc/PvP duel. Fixed an issue with players being able to mantle vertical walls in the Mastery Rank 7 & 8 tests and falling to their deaths. Fixed an issue with clients getting the first periodic Survival reward during Alerts. Fixed an issue with the Liset seen in the tutorial having no proper collision. Fixed an instance of incorrect VO playing during the Vor's Prize mission. Fixed a number of map holes in the Lephantis boss arena. Fixed an issue with Oberon's Renewal not being properly castable with exactly 25 energy left. Fixed an issue with the visual effect from Oberon’s Renewal not disappearing correctly when a client casts the ability with exactly 25 energy left. Fixed an issue with Nyx’s Absorb not properly costing 7/6/5/4 energy a second. Fixed an issue with being able to scroll through the Kubrow Stasis chamber menu while in other sections if using the mousewheel. Fixed an issue with the Chat window not properly maximizing when selecting to talk to a user via the Friends/Clan screens. Fixed an issue with the Ascaris not appearing on Warframes during the Vor's Prize tutorial mission. Fixed an issue Infested Ancient hit-boxes not being properly scaled thus causing projectiles to pass through them. Fixed an issue with blue visual effects building up and persisting when opening and closing the Arsenal/Mod Station modules *repeatedly. Fixed an issue with Valkyr’s Warcry armor buff not properly being removed after the ability ends. Fixed an issue with the Torid in the Foundry not appearing correctly. Fixed an issue with the Iliad node name not appearing correctly. Fixed an issue with Mod filters hiding fusion cores. Fixed an issue with the Excavator not appearing right away after entering the Objective areas, this fix will be observed on re-release of this mission type. Fixed an issue with players being able to get stuck at the bottom of Grineer asteroid tileset levels. Fixed a number of map holes in the Corpus Outpost tilesets. Fixed an issue with Nova’s Wormhole ‘beam’ visual effects appearing offset from the portal visuals. Fixed an issue with Nova’s Wormhole duration not being affected by duration mods. Fixed an issue with the player being incorrectly rotated after being teleported. Fixed an issue with Hyena playing an incorrect animation when stunned. Fixed an issue with the player's Warframes appearing in front of the Solar Map after opening the Foundry. Fixed an issue with players losing some functionality after leaving a squad/session during map selection vote. Fixed an issue with the Leaderboards not properly displaying weekly kill stats. Fixed an issue with multiple Djinn entries being listed in the Codex. Fixed an issue with multiple weapons appearing in the Codex even if they are not owned by the player. Fixed an issue with players attempting to join the defenders of an in progress Dark Sector mission receiving an erroneous "Session is full" message. Fixed an issue with players having the wait the full 60s if a countdown timer is started before the last person accepts in key lobby. Added an "OWNED" label to purchased items shown in the Market. Added in new Sound Quake stun animations for Grineer troopers. Added in a new SMAA Antialiasing option (this has better detail preservation than our FXAA option). Note: This new option is on by default. This antialiasing option is slightly more system intensive than the current FXAA option, and if you experience performance issues you may want to switch to the old FXAA option. Slightly reduced the level of enemies on Earth, Venus, and Mars missions. Renamed the "Cold Touch" mod to "Vicious Frost". Improved the low frequency reverb sound effects. Radial Disarm will now deal damage to Infested enemies in addition to losing their weapon if applicable. Eximus and Hellion enemies on the Forest tileset now have a base level of 15. Increased Torid’s ammo capacity to 60. Increased the critical chance on the Torid to 15% and the chance to proc its effect to 20%. Firestorm mods will now affect Torid gas clouds. Improved the performance of frozen death effects from the Glaxion. Improved the ammo consumption and critical chance on the Glaxion. Improved the performance of the Hallowed Ground ability on low spec computers. Improved the targeting responsiveness of Smite projectiles. Fixed multiple issues with enemy AI getting stuck inside art assets and being unable to navigate certain areas of the Ice Planet tileset. Fixed an issue erroneous “Mission Failure” messages appearing during Excavation missions. Fixed an issue with Nyx ability Mods not being properly granted after buying/crafting the frame. Fixed an issue with Excavators sometimes being missing during Excavation missions. Fixed the magazine drop animation not playing properly on the Nukor and Galaxion. Fixed missing drop shadow on chat text. Fixed the rank not being displayed correctly on the Coolant Leak mod. Fixed an issue with Kubrow Eggs not appearing as purchased in the Market. Fixed an issue with Nyx's Absorb being useable during bleedout. Fixed an issue Oberon's Reckoning blinding enemies around the caster and not the slammed targets. Fixed an issue with certain minibosses teleporting into non-battle space areas. Fixed an audio glitch heard in Orokin Void defense missions. Fixed an issue with the mouse wheel not working correctly on the invite and squad menu screens. Fixed some fonts appearing incorrectly on the End of Match screen. Fixed an issue with the Mission Failed screen returning the player to the Ship at the 6 count and not the end of the countdown. Fixed a grammatical error in the event reward message. Fixed an issue with Smite projectiles sometimes colliding with each other. Fixed an issue with Chat tabs continuing to blink when they are selected and the window is maximized. Fixed the visual effects appearing incorrectly on the Torid. Fixed an issue with Nightmare modes not having their proper debuff applied when playing on Rescue event missions. Fixed an issue with clients being unable to see the magnetic bubbles after the alarm is triggered during Infested Rescue missions. Fixed an issue with enemies affected by Molecular Prime not detonating until after their death animation is finished. Fixed an issue with Player Names and Player Stats ending up in wrong positions. Fixed an issue with Corpus Tech enemies not properly deploying Shield Drones. Fixed an issue with additional, erroneous objective markers appearing when completing Mobile Defense missions on Asteroid tilesets. Fixed an issue with the Chat window not opening correctly when selecting Communication, Friends, or Talk while in game. Fixed an issue with Radial Blind (and other abilities that prompt AI reaction animations) causing Infested Crawlers to cease normal functionality. Fixed long Clan names overlapping the points column on the Leaderboards. Fixed an issue with Infested Crawlers occasionally attacking their teammates if deployed right as their Carrier is destroyed. Disabled depth-fog for forest defense missions at night. Fixed iron skin material for regular rhino. Fixed crazy fog in the last few meters of the hallway out into the forest defense tile. Mod cards that you haven't unlocked will now have their stats hidden and will be darkened in the Codex. Added missing hit effects for certain weapons on ice and snow. Added missing sounds in ice tile set. Changed Mirage Alt Helm to be untradable. Removed blur from Kubrow claiming screen. Tweaked Arsenal text to help with legibility. Optimized Swift Deth, Striker, and Thumper precepts to improve performance and reduce network traffic. Removed scrollbar in stats page to avoid confusion that you can scroll further. Fixed clients falling through the ground in the Ice tileset upon entering the mission. Fixed getting stuck in dodge state when rolling through Corpus laser doors while melee blocking. Fixed DirectX 10 option in launcher (it was not actually enabling the driver in game). Fixed Sacrifice precept (sentinel was not always dieing after reviving the player). Fixed energy color changing when selecting a primary/secondary color on some weapons in the Arsenal. Fixed sound effects for ice bridge collapse. Fixed people standing up during bleed-out to complete panel hack animations. Fixed objective progress bar not appearing after a host migration. Fixed restores not traveling with players in moving elevators. Fixed issue where clients couldn’t shatter frozen enemies. Fixed a crash caused by host migration. Fixed a crash that could occur when joining a host while that host is shutting down to join someone else. Optimized network performance for several sentinel firing precepts. Fixed end of mission grey screen of death. Added new filter categories for each polarity to the module browser. Reduced the explosive damage of the Jackals rockets/grenades. Changed Excavate to match Survival end of mission rewards in the sense of not giving out extra rewards since you earn them periodically throughout gameplay. Tweaked Torid’s visual damage range. Fixed a number of level holes and missing assets in the Europa Excavation mission. Fixed not being able to pick up multiple datamasses in spy missions. Fixed players joining an Excavation match in progress and not seeing the Excavation UI on screen. Fixed Mirage’s Eclipse lasting forever when cast. Fixed Oberon’s Renewal blocking other abilities/melee when active. Fixed the navigation menu not resetting properly after deploying an extractor. Tweaked excavation level layouts to reduce marathon-fatigue. Players can now only carry 1 power cell at a time as to increase difficulty. Fixed extraction timer overlapping excavation info text. Fixed issue where the scanner wouldn't drop if a host migration occurred momentarily before. Fixed Aura/Stances not showing capacity gain in the max capacity. Fixed ">" and "<" appearing as ">" and "<" in the chat window. Fixed chat history not fading away after a certain period of inactivity. Fixed Kubrow puppy running away when attempting to claim. Fixed score for Cryotic Front not being properly displayed in players profile. Fixed players being able to join event nodes that they haven’t unlocked. Fixed popup text for invitations to excavation missions. Fixed portrait of the "New Associate" in inbox. Fixed mod screen becoming unresponsive after fusing mods then switching categories. Play the new Excavation missions! The Location of a ‘Scanning Device’ will appear on your minimap for you to locate. Collect Power Cells dropped by enemies, and bring them to the Scanner to activate it and keep it powered. You can track your Scanner’s power in the map on your HUD. If it reaches 0%, the process will stall until power is restored. Defend the Scanner as it searches for a dig site. Once the Scanner has found a site, it will appear on your map. Proceed to that location to find an Excavator that is digging for artifacts. Take caution! Enemy waves will attempt to destroy the Excavator, and you must defend it. The Excavator will also continue to lose power. As with the Scanner, you must collect Power Cells to keep it activated. Once the Excavator has uncovered the artifact, you may choose to Extract from the operation or wait for another Scanner and repeat the process. There are three available Tilesets for this Operation. What is CRYOTIC (New Resource)? If the Excavator is destroyed before it recovers an item, the mission is a failure. The Operation is on now until Wednesday, September 3 at 12 PM EDT. Operation Cryotic Front is the first introduction of a new mission type that will replace all Survival missions that take place on a terrestrial tileset. This Operation introduces Cryotic, a new resource that will only be available in the Excavation game mode. At each of the point levels below and you’ll unlock a new Tileset in the Operation. It’s your choice – continue to dig on Earth or take your efforts to these new areas. Note that each new Tileset will hold more difficult enemies but will provide the opportunity to earn points faster. REWARDS With each successful dig, you will receive an amount of Cryotic based on your performance (100 max.) The more Cryotic you earn, the better the Reward – so dig on! The top three Clans per Clan Tier will receive Gold, Silver, and Bronze Trophies. For Clan Leaderboards, a Clan’s score is the sum of active personal bests. New Tileset Preview - Corpus Ice Planet! Progress with fellow Tenno in the Operation Cryotic Front event to explore the new frozen tundras! New Game Mode - Excavation! This gamemode will be replacing On-Planet Survival missions. Give it a try today and let us know what you think! This is our first pass and we’re very interested in your thoughts, please visit our Feedback megathread to add your thoughts! The objectives are: Seek out artifacts by powering scanners with power cells dropped by enemies and defend the artifact excavators for as long as you can! Fires a photon beam that halts molecular vibrations, causing instant and painful freezing. The Kronen resurrects a lethal fighting style once thought lost to the ages. The Kronen comes with an entirely new stance, GEMINI CROSS! Creates and focuses a high-frequency field of microwaves literally cooking the target from within. New Customization - 2 color pickers! Get the Lotus colour picker and the Eximus Colour picker today! New Customization - Hecate Syandana! Corpus Dynamic music is here! Much like the Grineer and Infested, Corpus missions now sport their own music which is dynamically generated based on mission events! Added more diagnostics to error messages for invitation and joining problems. Added Corrupted category to kill stats. Added a "Talk" option to the context menu in Recent players screen that will open up a private conversation tab in the chat window. Added toggle to disable HUD damage/XP numbers in the in-game Options. Added new Colour Customization options available through 2 new packs! These packs are brand new colours that can be applied to your current Kubrow patterns! Added a base palette pack that includes 5 colors you can play with for 100K credits! Kubrows are now in free-roam mode on the Liset! Price of DNA Stabilizers reduced from 100k to 75k credits. Added a “Consign to the Lotus” button for unwanted Kubrows. Fear not, the Lotus shall take care of them! Additional animations for Kubrow Cubs! Added Kubrow filters for Mods. Oberon’s base Armor increased to 150. Projectiles that are spawned after impact seek-to-target, not just spawned in direction. Speed up projectiles by 50%. Forced Radiation proc on the initial target. Forced Knock-down on initial target instead of stumble. Forced Puncture proc on all enemies hit. Allies within Hallowed Ground can not be proc’ed. Hallowed Ground will remove all existing procs from Allies. Armour boosted by 5/10/15/20% per rank for all Allies on Hallowed Ground, with stacking being explored on multiple casts. Switch to toggle ability with smaller base cost and energy per second active drain. All Renewal benefits occur when projectile reaches target ally. Boost Heal amount 200/250/300/400 per rank. When target is fully healed, remove any active proc effects. Allies affected by Renewal have slowed bleedout by 20/25/35/45% per rank. This is affected by duration mods. Forced Radiation Proc added to damage on targets. Small radial blind added to slam impact, but only for enemies that survive the damage of the cast. This radial blind will be applied to enemies that move into range after it’s been cast and are blinded by the impact of those being slammed by Reckoning! Made Vauban's Vortex scale with power range and duration mods. Nyx’s Absorb has had it’s passive energy drain significantly reduced from 10 energy per second to 4 energy per second, and instead now has an energy drain based on incoming damage. This drain is 8 energy per 1000 damage. These drainage values are affected with the use of mods. In an effort to compensate for more useful attribution of XP when triggering a chain reaction with Molecular Prime, the main XP is attributed to whoever started the chain reaction. Before, Nova would take the bulk of the attribution. Now, the "weapon and instigator" carry through the whole explosion chain ( if Player A casts Molecular Prime and Player B blows up the room, Player B gets the kills and XP). Similarly, if Player A casts Molecular Prime to Crowd-Control and then use their slowed state to get a nice bow-shot, Player B get weapon XP. Fixed some of the cases where two Nova's casting Molecular Prime would have unexpected results (explosion range and strength were always determined by the Nova who cast most recently). Added HUD counter for Rhino Stomp to show how much longer you have left on your CC (and how long to wait until re-stomp). Banshee's Sonar, and the Enemy Radar/Sense mods ignore security cameras and turrets. Banshee’s Sonar now uses Energy Colour. Saryn’s Miasma can now be cast mid-air. Changed FX of Laser Doors when affected by Mirage’s abilities to better indicate you’re safe to run through. Update several Foley sounds: more updates to Tenno step, fixed rhythm and step events for wall running. Updated Host Election code to work with new squad system (had been disabled since Update 14). Added more details to error messages for invitation and join problems (we are hoping that more information will help us isolate any remaining problems with the invitation system). Fixed the UI still showing stats for a “Charge Attack” when looking at Melee weapons. Fixed all consumable restoration totems (Energy, Health, etc) not travelling with you on elevators when you ascend or descend. Fixed Player’s game freezing for short periods when decorations complete while in the Dojo. Fixed Dendra armor colour not updating until you leave the attachments part of the Arsenal. This should also fix Ember’s FX, Nova’s helmets, Frost’s jets, Ember Prime’s flaming Mohawk, and the Silva & Aegis. Fixed Silva & Aegis Codex Diorama not having proper fire effects. Fixed Sentinel vibrating when riding in an elevator. Fixed several navigation holes across numerous tilesets, particularly in places where Infested would get stuck. Fixed for Kubrow pet spawning behind player for intro cinematic when spawning in a mission. Fixed several issues with controller navigation on Big Picture. Fixed several localization issues across several languages. Multiple crash & game freeze fixes. Fixed opening View Mission Progress while an elevator is moving will cause the camera to stay in one place until View Mission Progress is closed. Fixed issue with player’s HUDs failing upon reviving. Fixed Mirage’s Hall of Mirrors not being affected by some mods (Heavy Caliber). Fixed Clients being stuck on the ‘Please Wait’ spinner when accepting an invite or joining through friends list. Fixed players being able to invite anyone to Conclave sessions regardless of Conclave ratings. Fixed issues where Kubrow loyalty would not be restored if the pet interaction did not play. Fixed issues with stale and latent sessions occurring with Dojo matchmaking when users join rail editing sessions. Fixed issues in Infested Mobile Defense where the gas that damages the player at the 2nd defense point also damages the objective you must defend. Fixed issues with the “/invite” not working correctly when doing session checks. Fixed issues with the Pyra Syandana falling in front of the Warframe when viewed from the back. Fixed issues with Alert Defense missions on the Galleon tileset spawning multiple Defense targets. Fixed Extractor counts in the Foundry displays as "1 owned" when the player has multiple extractors of that type in their inventory. Fixed an issue where the player could leave critical actions unbound when changing their key bindings during the tutorial. Fixed issue when a resource falls into a teleport volume it will remain down where it fell for Clients. Fixed Helios endlessly rescanning things not in the Codex. Specific examples: void turrets, arc traps, Grineer laser sensors above doors, smashable grates & fans. Fixed issue with Dex Furis muzzle flash not being customizable. Fixed issues with consumables purchased through Arsenal not being automatically equipped. Fixed issue if when the player is in the rail management screen, and they press the pause menu button, the pause menu will open behind the rail management screen. However once they do this they will be unable to close the pause menu as well be unable to exit the rail management screen. Fixed issue where Crit damage and Crit chance are not increased by mods for Sentinel weapons. Fixed issues with overlapping text in solar rail deployments. Fixed an issue where the player could attempt to bring up the pause menu while viewing any part of the Codex, which led to an inconsistent UI experience. Now attempting to open the pause menu while in the Codex will function the same as if the player wishes to back out of the current screen. Fixed issue where it would become possible to lose functionality in certain Dark Sector conflict scenarios. Fixed issue where players could finish the tutorial without gaining any XP in gear causing account issues later on. Fixed issues with long Kubrow names clipping outside stasis slots. Fixed rank-up tests being rendered unbeatable if proper loadout isn`t active, no prompts inform user of necessary loadout. Fixed issue where if a players rejoins a lobby after having previously run out of revives in that same lobby, they will not properly be put into spectator mode and will be have no functionality until the other players complete the mission. Fixed Infested Ancients and Grineer Scorpions from using their grapple pull ability on Saryn's Molt avatar and Loki's Decoy avatar as it would not behave well (would have them pause for a few moments, if Molt was used again it would script error and break the enemy). This also fixes a similar issue with Vay Hek’s beam-zap attack. Fixed issues with Sentinel ‘Weapon Slot’ behavior in Arsenal when switching between Sentinels and Kubrows. Fixed issues with blank “Trigger” types in the UI for Penta, Castanas and Deconstructor. Fixed issues with navigating the UI with arrow keys equipping things unintentionally - arrow key navigation in Arsenal has been disabled. Fixed issue where performing any melee action, then using a context action (Hack Console, Revive Ally), would result in an additional melee action after the context action was complete. Introducing "Tactical Alert" missions(Forum Post). Reduced conclave ratings for MK-1 weapons. Increased conclave ratings for Brakk, Twin Wraith Vipers, and Boltor Prime. Fixed "Install Segment" prompt in Liset not always being immediately available after one has been acquired from a mission. Fixed cases where MK-1 weapons that had been acquired during the Tutorial would never gain XP. Fixed customizations made to weapons and accessories not applying until player re-logs or re-enters the Arsenal screen. Fixed parrying after blocking in melee mode causing the currently equipped weapon to no longer function. Fixed some additional cases of being able to place Dojo Decorations in unintended locations. Fixed Eximus' aura visual effects lingering on enemies after they have been killed. Fixed Arsenal UI hang that could occur when purchasing a Sentinel from the "Equip" screen. Fixed an issue with host migration in Clan Dojo. MK-1 weapons have been added to the market. MK-1 weapons can now be seen in the codex. Removed Delta Beacon from drop tables found on Prosecutors outside of Defense missions. increased the maximum amount of Kappa, Gamma, and Omega beacons that can be received in one drop. The "Squads" label will now always appear when hovering over missions in Public matchmaking mode for consistancy. Fixed an issue with Volatile Runners not properly damaging Clients. Fixed an issue Inbox message prompts clashing with Play Tutorial prompts when first logging in after the Update 14 launch. Fixed an issue with Coolant Leak getting stuck affecting in-range friendlies after a Radiation proc. Fixed an issue with Inbox messages initializing before fully loading back into the Liset which could cause a case of unresponsive UI. Fixed a number of map holes on the Grineer Galleon tileset. Fixed an issue with Host's being able to invite clients to a Conclave mission regardless of the Client's conclave rating. Fixed an instance of Clients getting stuck on the Please Wait loading spinner when accepting an invite or joining a match through the friends list. Fixed an exploit which allowed players to bypass Conclave lockouts. Fixed being unable to melee or use the Codex when equipping the scanner while Hysteria is active. Fixed an issue with having no weapon properly equipped after attempting to use a Codex scanner while Hysteria is active. Fixed an issue with Oberon's Smite projectiles passing straight through enemies. Fixed an issue with the Prism ability not properly affecting enemy Clients in Dark Sector conflicts. Fixed Trinity's Blessing Ability not providing a consistent damage reduction value across all affected beings. Fixed an issue with enemy AI breaking if they attempted to use a grapple pull ability on Saryn's Molt and Loki's Decoy avatars. Fixed an issue with players being able to get stuck inside certain walls in the tutorial levels. Fixed an issue with players being able to place decorations in invalid locations within their Dojo. Fixed an issue with Infested sometimes getting stuck in doorways on certain Grineer tilesets. Fixed an issue with the Drone Explosion sound effect not properly playing from the correct position. Fixed an issue with the Looter mod causing Sentinels to attack crates that have already been destroyed. Fixed an issue with Nyx's Absorb ability blocking Codex scans. Fixed an instance of AI becoming permanently blinded when struck by a Client's Radial Blind. The number of currently active join-able public squads is now displayed in the info popup when hovering over a mission node. Game invitations are now queued and can be individually accepted/declined when receiving invites from multiple players. Game invitations are no longer cleared when transitioning to/from a mission. Public matchmaking now avoids joining the same session twice in a row; if you don't find an acceptable squad (or experience network issues), leave the session and the next time you select that mission you will either find a different host or start hosting yourself. Fixed incorrect values being displayed for Sentinel's Crit Damage and Crit Chance in the Arsenal and Upgrades screens. Fixed a rare case where players could end up in the wrong mission if they managed to join a host who had crashed/disconnected and then re-hosted a different mission. Fixed being able to send game invites via the /invite chat command when not currently in a squad. Fixed crash when attempting to launch a Solar Rail Conflict mission under strict NAT. Fixed overlapping UI issues when viewing the Dark Sector information screen while the pause menu is active. Fixed non-functional settings for "Allow Invites" option. Fixed clients not being able to invite players to Clan Dojos. Fixed another cause of unresponsive Inbox UI when returning from mission. Fixed players not leaving Region, Trading, or Recruiting chat channels when launching a mission. Fixed enemies getting stuck in Eris Infested-Defense levels. Fixed issue where attempting to edit a Solar Rail Schema would result in the player being returned to the Liset. Improved performance of Thunderbolt explosions on low end systems. Fixed an edge case where players could join Conclaves without meeting the score requirement. Fixed temp-file build-up in appdata directory left by launcher updates. Fixed Ancient Healers trying to heal dead avatars. Avalanche Offensive is on until Monday @ 12 Noon EDT! You've helped the Red Veil in the past, now we want to return the favor. Our spies have discovered a large batch of Corpus Arctic Eximus are massing for training around the polar region of Mars. With so many Arctic Eximus gathered in one place, you have the perfect opportunity to strike a crippling blow against the Corpus field command. Go to Mars and take out as many of the Arctic Eximus as possible. We will offer you what we can from the spoils. Defeat the Corpus Arctic Eximus! Visit Mars and take out the specified amount of Arctic Eximus. Follow your individual progress bar to see how many Arctic Eximus you have defeated. Once you have fulfilled the objective, Cantis will contact you to congratulate you and provide you with your reward! Go forth and take down the Corpus Arctic Eximus, Tenno! Tenno Reinforcements: Karyst Dagger! Find it in the Market today for Platinum or Blueprint! Added in a Kubrow Category for Kubrow specific mods. Sessions will automatically be set to INVITE ONLY when a Key is selected. Countdowns will no longer auto start if a player joins a Public Key session. Clients will no longer see the START TIMER option in Key sessions as the Host now has exclusive control of when the mission will start. Clients can no longer invite other players to Key lobbies. Ammo capacity increased from 675 to 750. Ammo capacity reduced from 210 to 30. Ammo capacity reduced from 540 to 20. Damage increased from 50 to 100. Critical multiplier increased from 1.5x to 2x. Critical chance increased from 20% to 25%. Damage increased from 175 to 225. Proc chance increased from 5% to 30%. Reload time reduced from 1 to .85 of a second. Damage increased from 145 to 200. Clip size increased from 4 to 6. Reload time reduced from 4 to 3 seconds. Base ammo increased to 30 (from proposed 21) considering the volume of projectiles launched. Fire rate increase – almost doubled. Clip size increased from 8 to 16. Damage increased from 100 to 125. Both are now more Ammo efficient. More base ammo in clips. Damage Increases for both weapons. Added 2.5 puncture depth (3 for Vandal). Increased damage from 100 to 125 (125 to 150 for Vandal). Reduced reload time from 4 s to 3.5 s.
Impact of Projectile: 15% Proc Chance. Now has 10% Critical Chance. Now has 40 DPS in Gas Cloud. Launcher weapons now use Sniper Ammo Pool. Banshee's Silence no longer affects the Stalker. Uranus Dark Sector nodes have been moved around so as to ensure that they are not side by side anymore. Tweaked the sound effects for the Escape Pod in Infested Capture mission. Introducing Rail Parties! Editing a Custom Rail Schema now creates a proper session like the Dojo. Improvements made to loading screen performance. Fixed an issue with enemies not being properly silenced by Clients using Banshee's Silence ability. Fixed an issue with Banshee's Silence not properly affecting Specters or player opponents in Dark Sector missions. Fixed issue with Ogris rockets that killed Infested Runners having their damage be used on the pod as well as part of the Runner’s explosion. Fixed an issue with the Sunika Kubrow erroneously changing sizes when performing a finisher. Fixed an issue with attempting to invite someone through the right click menu causing a loss of game functionality. Fixed an issue with Infested Rescue missions not failing correctly when the timer runs out. Fixed a crash related purchasing Forma for polarizing a weapon. Fixed an issue with squads attempting to join Dark Sector defender missions getting stuck loading into a blank screen. Fixed a number of map holes in the Infested Mobile Defense missions. Fixed an issue with excessive motion blur being seen in the elevators on Shipyards Defense and Gast City missions. Fixed an issue with Antimatter Drop not dealing the correct amount of damage when used by Clients. Fixed an issue with Mirage’s Eclipse damage bonus not applying to all damage types (like Penta explosion). Fixed an issue with Wormhole being immediately recastable on Clients under certain scenarios. Fixed an issue with Sentinels and Kubrows being attracted towards loot containers affected by Sleight of Hand. Fixed a number of animation issues seen with Mirage's agile and noble idle animations. Fixed an issue with Ancient Healers being scaled incorrectly when affected by Well of Life. Fixed an issue with Molecular Prime not giving damage bonuses to Clients. Fixed a crash related to purchasing a Forma while in the Arsenal and then attempting to perform a polarization. Fixed an issue with Bullet Attractor appearing incorrectly in PvP matches. Fixed an issue with players being unable to enter Clan Dojos via the Clan menu if there was a host and client already in the Dojo. Fixed an issue with players being unable to switch matchmaking modes if they have previously cancelled a node selection. Fixed an issue with matchmaking sometimes attempting to place a player in their own lobby. Fixed an issue with the Friends List not always functioning correctly. Fixed an issue players being in a cross-team chat channel when being invited to Dark Sectors by an attacker. Fixed an issue with Sentinel precepts being applied to Kubrow's on the Liset. Fixed Shield Disruption aura removing player shields. Fixed Kubrow bleedout marker not disappearing on Kubrow death. Added a delay in joining the ‘Recruit’ and ‘Trade’ channels. The Chat member list only populates if you have spoken in the channel, which will make it significantly easier to find people in the list and PM them. Additional sound effects for highlighting Squad and Inbox drop-down options have been added! Added in sounds and animations for Escape Pods in Infested Capture missions! Added a transition animation and dimmer to the Invite panel so as to help separate it from background UI elements. Planets will now display the total amount of missions completed by the player when zooming in to view their details. Reduced the total number of Bladestorm targets in Dark Sector Conflicts. Reduced the Snow Globe health and duration in Dark Sector conflicts. Regeneration stations have been removed from a number of starting Dark Sector tiles. Tweaked the Kubrow/Kubrow puppy sound effects in the Liset. Tweaked the sound effects on Nyx's Absorb. Tweaked the ambient sound effects for Infested Capture missions. Improved the performance of a number of water art assets on low-end PC's. Improved the performance of a number of Rank Up test levels. Friend/Invite-Only/Key sessions: The Mission Start countdown will no longer start when one player readies up. Friend/Invite-Only/Key sessions: The host can now cancel the countdown without leaving the entire squad. The right click window on private conversation tabs will now function the same and provide the same options as right clicking on conversation partner's name in the Users list. On going performance improvements including better User list refreshing. Bleed out timers will now be displayed as Health when playing in Dark Sectors, allowing for enemy Tenno to be killed once they're downed. Players will now be able to bleed out correctly when playing alone in Dark Sector missions. Receiving multiple instances of damage will no longer instantly kill them before entering the bleed out state. Shields will no longer regenerate on corpses after completely bleeding out. Fixed another instance of poison gas not properly damaging the player in Infested Defense missions. Fixed an issue with the player being sent into an empty Dark Sector map when launching any node after cancelling out of a Dark Sector node selection. Fixed an issue with objective markers being missing in certain Settlement Rescue tiles. Fixed an issue with Extractor UI interfering with the Arsenal UI which could lead to a loss of functionality. Fixed a typo seen on the "Invite Only" tag when returning to the Solar Map after completing a mission. Fixed an issue with the Chat window not rendering correctly if the player was able to enter the game without being able to connect to any Chat regions. Fixed an issue with match making no longer working for clients if the host of their current session leaves during a mission countdown. Fixed an issue with the HUD and in game transmissions not appearing correctly when joining an in-progress Interception mission. Fixed an issue with players having their camera temporarily detached from their Warframe when opening the Pause menu after logging in. Fixed an issue with players being able to start private conversations with themselves. Fixed an issue with the Exit button not working correctly on the Trade menu. Fixed an issue with key rebinding of movement keys not saving correctly after re-launching Warframe. Fixed an issue with certain Mods (i.e Heavy Caliber) not working correctly with Hall of Mirror clones. Fixed an issue with enemy AI getting stuck attempting to navigate around certain art assets on Infested Mobile Defense missions. Fixed an issue with players being able to enter Dojo rooms that were under construction. Fixed an issue with Clients being able to kill Sentinels equipped with Regen abilities in Dark Sector missions. Fixed a number of environmental visual effects in the Grineer Forest tilesets not displaying correctly. Fixed an issue with the player getting stuck on a "Please Wait" screen when attempting to join another lobby after completing a mission. Fixed an issue with the player being unable to interact with the Solar Map when the Vor’s Prize mission quest was active. Fixed the weak spot indicators not appearing correctly for clients. Fixed AI frames only being able to cast the ability once. Fixed an issue with all the enemy minimap markers being removed once a single affected enemy is killed. Fixed an issue with the weak spot indicator being removed prematurely when the ability is cast again. Fixed an issue with the weak spot damage amplification not being correctly removed after the ability ends. New Infested Capture missions are here! Play them today on Eris! DNA Decay rate for Kubrows has been halved. This should better accommodate concerns about upkeep costs and requirements to tend to your Kubrow. Penta shots fired from Hall of Mirror clones will no longer display weapon trails. Tweaked the visual fidelity on Castanas explosions spawned from Hall of Mirror clones. Reduced the amount of vacuum damage received in Infested Defense missions. Tweaked the visuals and improved the performance on the Liset loading screens - your Liset is now pilot-able on loading screens! Reworked appearance aspects of the Dendra Armor to appear more impressive and high quality. Fixed an issue with downed players who are out of revives temporarily preventing squad members from finishing missions. Fixed an issue with players being able to cancel out of Mission Complete screen during the Outro cinematic which would cause them to get dumped back into the level. Fixed an issue with the poison clouds in Infested Defense missions not consistently damaging players. Fixed an issue with players being able to get stuck inside Dojo doors. Fixed an exploit which allowed players to gain inordinate amount of experience in the Tutorial levels. Fixed an issue with matchmaking no longer working for clients if the host left the lobby during the mission countdown. Fixed an issue with Split Chamber and the Quanta resulting in a face explosion when fired, projectiles from the same ‘shot’ will no longer collide with each other. Fixed an issue with join in-progress functionality not working correctly for publicly hosted alerts, invasion, Conclave, Dark Sector, and Nightmare missions. Fixed an issue with players not in clans being unable to launch Dark Sector missions. Added a ‘Legacy Palettes: On/Off’ option in the UI to give players the option to revert all colour palettes to the pre-gamma fix state (find this in Gameplay tab Options). Added in new environmental hazards for Infested Ship Mobile Defense: Poison Gas will now appear and deal Damage over Time while you are defending, you will have to seek out the ‘vent gas’ panel to disperse the hazard! Added ambient audio to Infested Defense mission spawn area. Cinematics will no longer forcibly close down crucial narrative critical transmission. Fixed a progression stopper issue on Infested Rescue 2.0 related to destroying Hive tumors above doorways. Fixed ‘blank’ spacer nodes being counting in the total number of available mission nodes - Solar Map Progress claimed there were 259 playable nodes when in fact there are 246! Completionists may sigh in relief! Fixed a Dark Sector related crash. Fixed an issue with Spectres becoming unresponsive in certain situations. Fixed an issue certain dioramas not properly displaying the player's Warframe model. Fixed a number of stuck spots in Infested Defense tilesets, many of which would have Infested rotating on the spot. Fixed an issue with the channeling effects on the Dendra armor set not displaying correctly. Fixed an issue with Misa Syandana visuals not appearing correctly in game. Fixed an issue with the destroy tumor visual effects not appearing properly. Fixed a progression stopper related to falling into the Jackal room pits and not being teleported back up. Fixed a number of map holes in the Tutorial levels. Fixed an issue with rain effects in Shipyards levels appearing/disappearing abruptly when moving between tiles. Fixed an issue with Infested Ancients getting stuck when attempting to navigate through tunnels on certain Defense tilesets. Fixed an issue with node selections occurring when attempting to alter Squad Options while on the Solar Map. Fixed legibility issues with loading screen text on the bright yellow scene. Fixed an issue with the Quanta’s Alt Fire projectile not blowing up correctly for clients. Fixed matchmaking mode dropdown not being initialized to last-chosen option after restarting game. Fixed Dark Sector Conflict core cover being ‘open-able’ by the Defending team, when only the Attackers should be able to use this. We have fixes in progress for Infested Rescue 2.0 being uncomplete-able and will deploy as soon as we've nailed down a confirmed fix. Fixed extra NPC's spawning in Dark Sector Conflicts after Host Migration. Fixed negative Rifle damage occurring on Dark Sector Infested missions. Fixed planet labels being editable. Fixed preview not working correctly for the new Dendra armor set. Fixed mission icon not being correct for Infested Corpus Ship missions. Further fixes to squad formation issues when unwanted party members are able to join your sessions. Fixed planets appearing as black if you had Dynamic Lighting turned off. New Dendra Armor: Derived from Corpus protective technologies this armor will add even more energy flare to your Warframe! New Quanta Weapon: Originally designed for mineral extraction on large asteroids, this tool has recently been adapted for deadly military purposes! The Infested have further expanded on Eris! Introducing new Infested Rescue mission with new stakes! Also on Eris are brand new Defense and Mobile Defense maps, fight through Infested Corpus ships to defend your objectives! With the return of Infested comes the return of Mutagen as a Rare drop to Eris! Planet labels and Resource Icons have been added to the Solar Map and will appear on screen when hovering over nodes. Added a minimap marker for downed Kubrow to help guide the revive efforts. Altered the layout of certain Void extraction tiles so as to allow more Warframes to properly traverse designated wall run stretches. Increased the tileset complexity of Void Survival tilesets so as to allow for more instances of multi-door tiles spawning. Tweaked the Ambient sound effects heard in Infested tilesets. Tweaked a number of Kubrow animations. Slightly increased the frequency of Ordis general notification transmission. Tweaked the Mission Success/Failure UI sound effects. Tweaked a number of Kubrow sound effects. Fixed multiple enemy spawning issues in the Void tilesets. Fixed an issue with players being unable to host a lobby after playing a Dark Sector mission *with a squad of over 2 players. Fixed being unable to damage or hit Arc Traps with melee weapons. Fixed (for real this time) an issue with the Chat menu automatically selecting the Trade channeling as the default after completing a mission. Fixed an issue with Dark Sector Mission Complete screens showing incorrect Warframe levels. Fixed an issue with Infested Ancients getting stuck in certain art assets. Fixed an issue with Detron piece drops using the incorrect item pickup model. Fixed an issue with Clients seeing a Grineer Galleon when loading into a Void mission. Fixed an issue with the "Finding Squad" message not disappearing when failing to find/join a Dark Sector mission. Fixed an issue with the voting message not getting properly cleared when cancelling mission selection. Fixed an issue with an unresponsive Squad overlay sometimes appearing when loading into a Dark Sector mission. Fixed an issue with players being unable to scroll through the Mission Complete screen. Fixed a number of map holes found in the Liset. Fixed an issue with the loading spinner being misaligned when loading into a Dojo or Mission through a friend invite. Fixed an issue with squad host no longer receiving game invites after entering a mission and then returning to their Liset. Fixed issue where Matchmaking Preferences defaulted to ‘ALL’ when returning from missions, meaning unwanted users could join ‘Invite Only’ sessions and more. Fixed an issue with Kubrow's not scaling in size correctly after performing a finisher. Fixed an issue with Trinity's power icons appearing incorrectly. Fixed an issue with Arc Traps targeting Kubrows and Sentinels. They should not be targeted moving forward. Fixed an issue with other players being able to join Mastery Rank tests. Fixed an issue with group mission persisting despite the Host of a squad electing to leave the squad via the pause menu. Fixed a crash related to attempting to enter your Dojo. Fixed an issue with multiple buttons on the Clan screen not working correctly when accessed via the Solar Map. Fixed issue with progression on the Mirage ‘Hidden Messages’ quest if you already crafted the Chassis or already own a completed Mirage. Kubrows now have their own minimap marker and will appear on the minimap when you bring them along in missions! Installed Mods will now be displayed over any corresponding stats in the UI. Adjusted the sound of the Sentinel Burst Laser weapon hit effect. Tweaked the animations on Kubrow puppies. Increased the amount of screen space displayed in the Foundry when using larger Warframes. Adjusted the font on the Featured Item name and description so as to improve legibility. Improved the Mission Complete screen seen in Dark Sector conflicts so as to now display pertinent info related to the completed match included the Ranks of Weapons used during the match. Reduced the duration of Valkyr's Hysteria in Dark Sector conflicts. Reduced the duration of Vauban's Vortex in Dark Sector conflicts. Vauban's Bastille no longer affects downed players in Dark Sector conflicts. Reduced the damage reduction on Rhino's Iron Skin ability in Dark Sector conflicts. Reduced the amount of damage dealt by the bleeding proc associated with Ash's Shuriken ability in Dark Sector conflicts. Damage multipliers for the Amprex, Brakk, Drakgoon, Karak, Hind, Marelok, Mutalist Quanta, Tysis, AkLato, Burston Prime, Lato, Braton, Tetra, Tigris all normalized (no more arbitrary multipliers). Reduced the amount of damage of Ash's Bladestorm in Dark Sector conflicts. Fixed an issue where players would get forced into the Trade Channel when coming back from a mission. Fixed an issue with the HUD not properly displaying weapon information after equipping a melee weapon. Fixed issue where Clients in a dojo session were unable to send invites to users, and any attempts to send invites could result in a frozen ‘presence’. Fixed several squad connection issues including getting pulled into the wrong mission and players technically ‘connecting’ but not ever resulting in a session. Further efforts to fix loading screen hangs. Fixed an issue with players being unable to interact with Kubrows while having a melee weapon equipped. Fixed an issue with pet loyalty not being regained correctly when Kubrow interactions fail for whatever reason. Fixed an issue with Weapon Stats overlapping after a weapon skin has been applied. Fixed an issue with the Featured Item description text appearing to float in air in the Liset. Fixed an issue with Sentinel and Sentinel Weapon ranks being displayed as Unranked at the Mission Complete screen if the player's Sentinel died during the mission. Fixed an issue with Mod cards not being properly in focus when zoomed in. Fixed an issue with Stasis Recovery not properly ending which should cause certain imprints to not initialize correctly. Fixed an issue with pausing in Solo mode not always functioning as intended. Fixed an issue with the bottom row of the Mod screen being displayed incorrectly. Fixed an issue with mouse wheel scrolls not working correctly in all screens. Fixed an issue with Mods being upgradable beyond current equipment limits. Fixed an issue with Bleeding Out indicators not appearing above the heads of downed teammates in Dark Sector conflicts. Fixed an issue with matchmaking not working correctly on Phobos. Fixed an issue with Profile sub menus overlapping with the pause menu. Fixed an issue with the incorrect error prompt being displayed when attempting to rush weapon construction under certain scenarios. Fixed an issue with new players loading into their ship as Excalibur despite selecting a different starting frame. Fixed an issue where players session information was not getting cleared after exiting a Sector Wars mission and all game invites sent afterward to result in "could not join because session is full" due to subsequent squad session having no actual team slots. Fixed issue where players are not prompted to select a Schema when choosing to apply a Schema to a Solar Rail. Rhino Prime’s Iron Skin is now gold again! Added in settings for ‘Invite’ reception preferences. This setting allows you to choose from whom you receive game invites: All Players, Friends Only, or None. Added more idle animations for Kubrow Puppies. Added new animations for Silva & Aegis idles. Shifted the Cholistan Dark Sector node by one. Further finessed matchmaking logic to ensure your past presences are cleared before hosting or advertising matchmaking sessions. Tweaked wording to add clarity to Stasis message for Kubrow. Added number of remaining interactions to Kubrow menu. Sentinels and Kubrows are no longer able to spawn in Mastery Rank tests. These tests are for the Tenno to prove their worth, not the pets! Tweaked the sound of Frost's Snowglobe. Corrected Tenno Default Colour Picker to use proper Gamma colour values. Added a 3 second spawn invulnerability to prevent players from camping in spawn points. Added more visibility to nodes that are in conflict when navigating the Solar chart. Increased knockdown recovery speed for all frames in PvP Dark Sector conflicts (and Conclaves). Reduced incoming Health damage to 25% of current values. Reduced incoming Shield damage to 50% of current values. Added further UI support for Node selection and Conflict history for Dark Sectors. Pulled energy regeneration stations from levels. Increased the drop rate for Health and Energy orbs. Spread out spawn points on map. Cores can no longer be damaged/targeted by Warframe abilities. XP is no longer Radial and is shared Team wide. When joining a session, your level will now automatically be the same as the lowest leveled teammate in your session. Level cap is now 30 to be consistent with PvE. Fixed data not being reset when a player disconnects, resulting in wrong level, xp, etc. for players that might take their place. Fixed Blessing healing defense core and generator in Dark Sector conflicts. Fixed player health/shield/energy values. They should now scale up with your level instead of constant as if level 30. Changed the layout of the middle portion of Dark Sectors and moved the hack objectives to not be within sight of the defenders immediately after spawn. Added new sound and tactile feedback for Console context actions (Arming/Disarming). Changes to conflict logic: Clans can no longer play against their own rails (whether their Alliance or Clan). Players can now initiate the ESC menu prior to selecting the Prologue. The navigation console will now move backwards when focusing on Planets so as to avoid potential clipping issues. We now only focus on the news element when we interact with it. We increased the legibility of the Drop Down Menu background to make it more legible. Added consistency in material outlines to the Genetic Foundry, Auras, and the Drop Down Menu. Changed the amount of screen real estate used when receiving game invites as well as changed the method to accept game invites. You will now be notified via the bottom-right notification bumper when you are invited, and you can choose to Accept/Decline all invites through the Diagetic ESC menu. With this change, we also increased notification awareness and made it so that the squad panel should be visible and showing the particles with callout if you have an invite pending. We now remove the name of invite target from the panel after an invite has been sent to reduce spamming. Made Stances/Auras more legible in upgrades screen. Fixed ‘Invite’ button not showing up in the Dojo. Fixed Extractor icon not being removed when collecting the Extractor. Fixed items displayed in the grid format flickering. Fixed not being able to ‘teleport’ directly out of the Navigation screen to another menu (Foundry, etc). Fixed Matchmaking dropdown not functioning correctly when cancelling out of Solar Chart. Fixed a permanent hang when attempting to invite friends by pressing the “+” in the top left of the Squad info segment. Fixed players seeing the pause menu outline when a host migration occurred. Fixed overlapping UI when initiating the ESC menu. Fixed UI not prompting an 'Abort Mission' option when forfeiting after dying in a public mission. Fixed text overlapping in the Foundry. Fixed the appearance submenu in Arsenal having an extra top "Physique" title and bottom line in the middle of its elements when selecting certain melee weapons that have both a skin slot and an attachments submenu. We have recently discovered our Warframe Colour Customization choices are not gamma corrected when applied. We have rectified this issue, but you will see the difference in Steve’s Developer Workshop post ->here<-. Login to receive a FREE desaturated colour picker - it’ll be available for you to get for the next 2 weeks just by logging in! You may notice dramatic colour changes of your Kubrow - this is related to the above “Warframe Colour Customization Changes”. Kubrows are now immune to Orokin laser traps. Fixed an awkward floating animation that would occur when a bleeding out Kubrow was affected by 'Link Health'. Tweaked the range of 'Howl' to prevent enemies behind walls getting affected. Fixed Kubrow finishers dealing double damage. They will now do the same damage as their normal melee damage. The next step here is getting the Kubrow Damage values displaying in the UI, and we’ll get this up and running as soon as we can. Sorry for the disconnect. Fixed Kubrow size/appearance discrepancies on Client in sessions. Fixed 'Scavenge' causing permanent freezing when multiple Kubrow's tried to interact with the same locker. If there are multiple Kubrows in a mission, no more than one can target the same locker. Fixed typo in the ‘Howl’ Kubrow mod. Fixed Arcane Helmets being untradable. Fixed a common game crash/hang that would occur when adjusting matchmaking settings, or simply ‘quitting’ the game. Fixed crash that would occur when attempting to leave a squad. Fixed crashes caused by low-level low-integrity Kubrows instantly entering bleedout. Fixed crash that would occur when trying to remove the Parrot skin from your Carrier. Fixed crash that could occur when spawning into Dark Sectors mission. Fixed a game freeze that would occur when attempting to purchase an item to place in the Gear slot from the Arsenal menu. Fixed the “Hidden Messages” quest giving the wrong inbox message on the third leg of the quest. This fix includes a less ‘chatty’ Ordis for that leg of the quest. Fixed an issue with multiple Sentinel Codex entries not working correctly. Fixed Kubrow collar mission not being completable. Fixed issues with Clan name, Alliance name, and Message of the day appearing as exponents of the number 1. Fixed an issue with the Mirage’s Prism visuals persisting in the game world if the ability was casted repeatedly (spammed). Fixed an issue with Friendly NPCs, including Kubrows, being affected by the Sleight of Hand blind effect. Fixed issue where the Dual Cestra project can be started before you ever start the Fieldron research. Every other item in the energy lab has prior requirements except for Dual Cestras. Fixed an issue with the HUD becoming unresponsive when joining Interception missions. Fixed a progression stopper in the Europa Region resulting from a Conclave node being located between two PVE nodes. Fixed some awkward wording in a string about the Sunika Kubrow. Fixed a common Furax stance card appears in the combos list for Valkyr while Hysteria is active. Fixed the Rai-jin and Do-jin having identical descriptions. Fixed an issue with Search and Join options overlapping if the Accept button is hit repeatedly while searching for a match. Fixed the Carrier sentinel being seemingly 1 hit killed by enemy Kubrows and Volatile Infested. Partially fixed random disconnects at end of mission, efforts ongoing! Fixed issue where players can join or be invited to a Solo Lobby if a player enters and exits a mission and then sets their Matchmaking to Solo. Fixed issue where the Accept/Decline Invite panel overlapped other screens, even when it’s supposed to be invisible. Fixed being unable to create a squad outside of the navigation chart. Fixed water in the Forest Extraction tile being misaligned. Fixed Clients getting stuck when trying to get back to the main menu from a session. Fixed players being sent into the Harvester mission as Excalibur with default weapons. Fixed several Corpus Crewmen not having ability reaction anims (e.g. levitate for Bastille). Fixed alarm panels not resetting alarm sound and effects triggered by gamemode events. Fixed multi-sized elements in the Store having buttons that don't cover the elements entire height. Fixed Valkyr’s Hysteria not functioning properly if a player picked up a data mass while Hysteria is active. Fixed weapon charge amount not resetting when the weapon is ready to refire/charge. Fixed missing VO lines in the Rescue Darvo Tutorial Mission. Fixed being unable to close the Booster Pack popup on ‘how many days’ you wanted your Booster for. Fixed issue with missing Rare 10 cores seen here. On login, your 'broken' cores will be converted to a proper functioning core that will stack. Fixed Sentinels being un-colourable and the 'Default' option not functioning. Added in new Extractor Icons to differentiate between Extractor statuses. Added in Mod Slot icons to differentiate Stance and Aura slots. Improved game performance on the Liset when choosing to skip the Prologue. Improved the tracking of Key Missions removal/ownership to ensure that the Key is correctly removed from the proper owner. Solar Map input will now be ignored when hovering over the Chat window - this should prevent unwanted ‘click throughs’ to UI elements. Solar Map input will no longer be registered while the Invite screen is up as well. Improved the behaviours of friendly Tenno Specter defenders in Dark Sector battles. Added in a small glow behind icons on planets to help improve legibility. Kubrow abilities now give XP when used. Kubrow Mod ‘Hunt’ now scales with damage Mods, but has had it's base damage reduced to compensate. Kubrows no longer die after the player has died, and will instead remain in combat. Arc Traps will no longer spawn in Infested Missions. Increased the minimum level for Fire and Ice layers to have a chance to spawn to missions with enemy levels of 6 or higher. Tweaked the Kubrow bleedout animation. Lephantis and Alad V have received some balancing: the Single player and Coop max levels have been lowered. The damage from Lephantis' Explosive Projectiles and Zanuka's missiles have been reduced. Feral Kubrow have had their armor and their charge attack damage reduced. The Survival and Camera Alarm sound effect will no longer loop. Improved the Kubrow follow behaviour which should alleviate most of the“circling” issue. Changes in location of Prosecutors is live on Ceres, this was not explicitly called out in full on Update 14 but has been live since then. Endless mission types like Survival and Defense will now guarantee you Delta Beacons. Gamma, Omega, and Kappa Beacons can be found on Prosecutors on the non-endless mission types. Fixed an issue with Cipher voice overs not playing correctly. Added additional weapon switch hints near the Cipher. Changed the context action text to properly show "Cipher". Added in additional visual cues near the Cipher pickup area. Fixed Quick Thinking not working as described or intended. Fixed a number of crashes, specifically one that would occur frequently in the Polish and Japanese versions of the game. Fixed game freeze that would occur when exploring the colour picker for certain weapons. Fixed an issue with Uranus Nav Segment not dropping from the intended location. This prevented star chart progress. Fixed an issue with the Kubrow Quest ‘Howl of the Kubrow’ being incompletable. Fixed an issue with Prism's energy per second cost being reduced every time it is used when you have an ability efficiency mod (like Streamline) equipped. Fixed an issue with Well of Life getting stuck as power-in-use if the target is killed during the casting animation. Fixed an issue with Hall of Mirror clone projectiles persisting after the ability ends, causing DOT's to deal friendly damage. Fixed an issue with cancelling node selection on the Solar Map not properly updating your presence data (what your friends see that you’re up to on their list). Fixed an issue with Nightmare Mods only successfully being rewarded in Survival and Rescue missions. Fixed a number of lighting issues seen in the Prologue. Fixed an issue with Kubrows spawning incorrectly behind the player during intro cinematics. Fixed a loss of functionality that could occur when equipping items too quickly in the Arsenal. Fixed an issue with Clients not seeing proper impact visuals when assaulting perimeter shields in Dark Sector conflicts. Fixed an issue with pressing the Market button in the Codex causing the UI to break. Fixed an issue with the Configuration Text overlapping when playing in different languages. Fixed an issue with the Arsenal screen becoming inverted after browsing mods. Fixed an issue with players being able to interact with incubating Kubrow puppies in their domes. Fixed an issue with Kubrow legs not animating properly when they are in their laying down pose. Fixed an issue with the wrong resource drops appearing in Mercury. Fixed a game hang that would occur if you fused mods above another item’s capacity and pressed ‘Proceed’ when offered to remove from other gear. Fixed an issue with the Exit button in the Recent Player screen overlapping with other UI elements. Fixed an issue with Orokin Catalysts/Reactors not being purchasable directly through the Upgrade screen. Fixed an issue with revive prompts appearing above the heads of downed opponents in PvP. Fixed an issue with UI elements not properly being viewable while in the 4:3 aspect ratio. Fixed an issue with the water effects appearing incorrectly on Forest tilesets. Fixed an issue with Stamina Orbs lowering Stamina when the Shield Flux mod is equipped. Fixed an issue with Specter loadout screen freezing if you go to the Specter crafting screen first. Fixed an issue with Alliance emblems appearing as default Clan emblems on the Solar Chart in respective Dark Sector nodes. Fixed potential issues with inbox messages not getting sent. Fixed an issue with extremely large Alliance Vaults not properly displaying the amount of banked credits. Fixed team health restores draining health of other teammates. Fixed a broken subtitle in the “Rescue Darvo” questline. Unlisted 14.0.7 fix: Fixed Kubrow Starter Packs not giving 6 DNA Stabilizers, but only giving 1. Anyone who purchased a Kubrow Starter Pack before this hotfix is being retroactively compensated in a script. This Script will add 5 DNA Stabilizers for every 1 Kubrow Starter Pack purchased. Fixed an issue with Banshee's Immortal Skin always appearing white. Added in Dark Sector End-of-mission HUD messages to explain that the conflict ended instead of ‘lost connection’. This HUD screen shows the full amount of Battle Pay earned. Continued performance improvement to the Mod screen. Lowered the Tutorial Ballista's weapon damage. Added in a HUD indicator for Dark Sector Core Health. Reduced the delays on Kubrow's Scavenge ability. Teammate names will now be displayed in Dark Sectors to help distinguish them from enemies. The Kubrow Bite mod has been added to feral Kubrow drop tables, it was not intended to only be available through transmutation, it’s meant to be a drop. The Squad overlay screen will now draw above the load out screen. The Mod screen will now use the optimal resolution and the edges will fade away. Mods on the Mod Screen will now draw behind the player's avatar. The player's Warframe will now stand up when in the Mods screen so as not to obscure the player's view. An extra row on the bottom of the Mod screens has been added to ensure their full collection is shown on screen. Increased the size of the Icons that appear over planets on the Solar Map. Warning labels have been added to certain Hint text. Increased the size of font in the Arsenal menu. The Kubrow Hunt and Howl abilities will no longer trigger when enemies are not alerted. Fixed an issue with Dark Sector messages from Defenders indicating that they're playing for the attacking side. Fixed an issue with the player's hand clipping into the Kubrow when playing certain interaction animations. Fixed an issue with emblems on the Carabus Dethcube not being placed symmetrically on either side of it's body. Fixed an issue with Rai-Jin cannon's not being constructible in Schemas. Fixed an issue with the "Timeline Selection" text being unreadable. Fixed an excessive amount of desaturation seen on Melee Channeling colors. Fixed an issue with Nav Coordinate Icons appearing stretched in the Foundry. Fixed a number of map holes in the Dark Sector tilesets. Fixed an issue Ember Prime's Fire Mohawk having erroneous Melee Channeling effects applied to it. Fixed incorrect messages being displayed during Dark Sector conflicts. Fixed a number of Ordis lines getting prematurely cut off. Fixed an issue with client Hall of Mirror clones having all equipped Mods apply to all equipped weapons. Fixed an issue an issue with computer terminals spawning incorrectly on Infested Corpus tilesets. Fixed an issue with the Credit Bonus and Resource names overlapping in the Mission Complete screen. Fixed a game hang that could occur if you joined a host right as the mission ended. Fixed an Dark Sector exploit which players could get inside geometry. Fixed not being able to receive game invites from players who aren't on your friends list. A new visual effect has been added when a Kubrow Egg is picked up. Mutalist Osprey's have received a slight nerf. They will now charge every 8 seconds instead of every 4. The damage from the charge and poison cloud has been reduced by 50%. Overall health has been reduced slightly. The player's Warframe will no longer play idle animations when navigating the Market menu. Mutalist Osprey's have temporarily been removed from Infested Defense missions until their navigation abilities can be improved, again. Altered the name of the Kubrow Bleed Out modifier Mod to better describe the functionality. Increased the Bleedout duration of Kubrow's without the Loyal Companion mod to 3 seconds, please note you will now observe the bleed-out system working as intended as of this hotfix. Altered the visuals on the Infested Phage beam. Adjusted the menu position of the vote selections so as to avoid potential overlap. Trinity’s Blessing no longer affects defense pods. Hall of Mirror clones will now fade out and will no longer block your vision when looking in certain directions. The Color Picker menu is now sorted by Unlock status first meaning that unlocked palettes will appear first. Improved the performance of the Mod menus. Updated many of the moss textures on the Grineer Forest tilesets. The Stalker can now deactivate Hall of Mirrors. Kubrows now display the see-through glow as other allies do. Fixed an issue with a row of Mod being outside of the page scroll range. Fixed an issue with Clients zooming out of the Solar Map when the Host starts the load into a level. Fixed the rotation of Earth on the Solar Map. Fixed an issue with Hive being targeted by Bladestorm attacks. Fixed an issue bright white cubes appearing when channeling dark melee channeling effects. Fixed an issue with the team list breaking when initially loading into a level. Fixed an issue with file path strings appearing when using the Excalibur Proto armor skin. Fixed a number of AI navigation issues seen on the Grineer Galleon tilesets. Fixed an issue with a Common Furax stance mod being displayed in Hysteria's combo page. Fixed an issue with the Illiac Chest piece clipping into Ember, Nyx, and Mirage frames. Added the Matchmaking options (Solo, Public, Friends, Invite Only) on Squad overlay. Added clarity on Kubrow Loyalty message: 3 times a day! Added in a XP locked message that will be received when the player attempts to purchase an item from the Market that is currently XP locked. We have disabled the Kubrow Genetic Scrambler while we consider feedback on it. Optimized network usage in Friends and Clan page to avoid frequent problems with the ‘Enter Clan Dojo’ function not working and some instances of ‘Failed to Join Session’. These changed reduce stress on Router NAT when in these menus, which may improve networking in general. Restored the total resource count on Foundry recipes - example going from 100/100 to 23,138/100. Further improvements to Loading Screen performance. Adjusted difficulty of Survival on E Gate: we made a new simple outpost Survival procedural level and added to Venus - E Gate for beginner Survival missions. The largest areas were removed to make it easier. Added more latency in between Radio Chatter lines on the Liset. Turned down sound on Liset Floor ramp activating (some call it the in-ship slide). Included a max number of instances for explosions available with Mirage’s Sleight of Hand ability. Removed Arc Traps from Mercury missions. Arc Traps no longer target pets. Prevented outbreaks from occurring on locations on Earth that are part of the Tutorial. Mercury Vor uses the push-beam attack from Tutorial. Melee Blocking this is your friend! Lowered some node difficulty settings on Mercury, heavy defenders should no longer spawn in Sabotage. Adjusted Kubrow Mod ‘Thief’ values to be display-friendly instead of rounded percents and rewrote Kubrow Thief description to include the % value detail. Kubrow Breeding now only uses dominant traits (no surprises recessive genes anymore)! Don't show Market notification before unlocking the Market. Tweaked volume of ‘Level up’ sound when gear levels up in missions. Tweaked the sound effects heard during Forest Cave extraction cinematics. Reduced the amount of voice over repletion heard during the Kubrow quest. Bladestorm attacks will no longer affect enemies affected by Undertow. Improved the performance of Mirage’s Prism ability on lower end computers. Performance Improvements for Mirage + Hall of Mirrors and Angstrum, Ogris, Penta, and Mutalist Quanta, and Stug. Reduced the amount of transmission repetitions heard when entering the Map Screen during certain Quest missions. Improved performance on Mirage’s Prism when Particle Quality is set to low. Further Fixes for squads having more than 4 players in a mission. Fixed Clients NOT unlocking nodes when completing missions. Fixed timed missions breaking upon initializing the View Mission Progress screen. Fixed many bosses being Level 1 when they should be much higher (Lephantis, Sargas, etc). Fixed hitch that could occur when ranking up weapons and gear. Fixed lobby countdown going below 0. 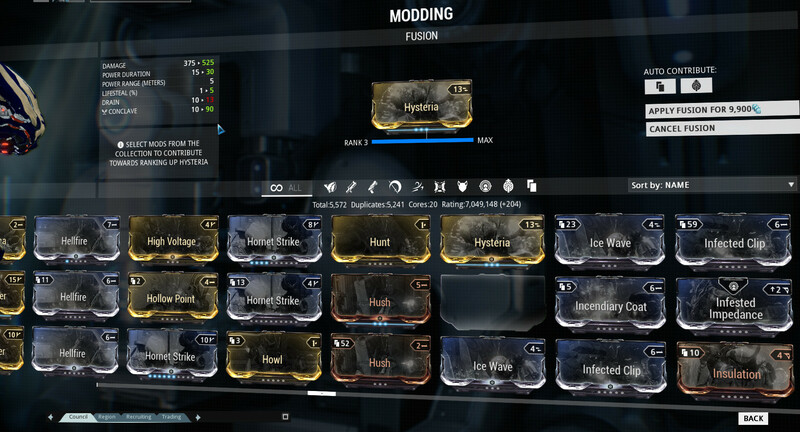 Fixed certain mods not working as intended on Kubrows. Kubrow quest - Only play Lotus "you need to find an egg" transmission after Incubator install, not on every retry attempt. Fix for Lotus "you found an egg" transmission never playing. Fixed issues with double clicking in UI not working correctly, players were having to click up to 3 or 4 times for desired changes. Fixed 60,000 countdown appearing when toggling from quickmatch to private/invite only after failing to find a session. Fixed a crash if you click on an item in the resource browser just as a level is changing. Fixed several other crashes on mission load. Fixed game hang when you have a Kubrow waiting to be claimed. Fixed end-of-mission loading screen hang caused by acquiring certain consumables in missions, notably the `Retrieve Foundry Segement`of Vor`s Prize. Fixed Mirage Hall of Mirror ‘illusions’ doing friendly damage in dojo duels, and possibly other places as well. Fixed cases of Mirage’s Hall of Mirrors Friendly Fire caused by temporary radiation induced faction change. Fixed floating extra clip from the AkZani that would remain if you are invisible. Fixed grammar errors in the Kubrow Quest intercepted message. Fixed rolling over the invite button when squad member leaves causing the buttons to show up improperly. Fixed crazy Kubrow colors when switching to an unused config in Arsenal. Fixed improper information in Codex Sector Wars area. Fixed depressurize sound playing during ship approach cinematic for Infested tiles. Fixed issues with Kubrows can not going into ‘Pre-Death’ aka a Revive-able state. Fixed Liset Bridge ambience cutting off if you're too close to the window with camera. Fixed Second Kubrow spawning after Host Migration has taken place. Fixed decorations being through Dojo floor on spawn. Fixed a client/host conflict that could cause a potential progression stopper in the Resources Tutorial mission. Fixed an issue with Sunika Kubrows not coming with their proper Mods when purchased. Fixed an issue with long player names causing an unwanted line break on the Mission Complete screen. Fixed the draw order of the Invite screen, this will prevent clickthroughs of chat going to click unwanted areas. Fixed positioning of a few zoom buttons to prevent activation if they aren’t actually visible. Fixed issue where Clients updating their loadout would appear to update everyone in the squad in the overlay. Fixed trade breaking when you try and trade Kubrow Imprints but don’t actually have any. Fixed an issue where the materials for the Ascaris Negator can be missing after the quest mission. This could happen if someone joined in progress, and did not pick up the materials. Fixed alignment issues with the ‘owned’ icon in the equipped screen. Fixed issue where you would be unable to Rotate/Preview gear with an overlapping grid of cosmetics (like the Syandana selection). Fixed invite button not working outside of top menu. Fixed game not checking for Conclave Rating when selecting Conclave nodes. PSA: A script is in progress to give mods to those account affected by the Sunika Kubrows not coming with the proper mods. PSA 2: If you built a Dojo Decoration during the 'sunk in floor' phase (July 18th till today), it will need to be rebuilt to be fixed. Significantly improved extremely long loading screens for missions, this was caused by poor frame-rate from joining parties. Fixed Mirage quest mid-point not sending transmissions to continue finding the parts. Fixed Vor’s Prize quest getting stuck on the ‘Raid Corpus Caches’ mission. Fixed Vor’s Prize quest remaining active on hud, but not ending entirely even after killing Vor. Fixed issues with Kubrow Loyalty. Firstly, added better descriptions to explain Loyalty overall. Secondly, fixed issue where players could ‘use up’ all their loyalty interactions even if the Kubrow was at 100% loyalty, resulting in wasted interactions. Lastly, Kubrow won’t ‘happy react’ if their loyalty is at 100%, they simply cannot be any happier and this should indicate action is having no effect on the loyalty. Fixed issues with inconsistency in ‘owned’ label between Foundry and Market. Fixed being unable to invite unranked players to Clans. Fixed issues for being unable to sell various Mods or Weapons from Inventory. Hotfix 14.0.3: (PSA: Header of Forums will be updated shortly, I know it still says 14.0.1). Fixed Vor’s prize getting stuck on Mercury Nav segment stage. Fixed missing indicators, including quest indicators, when a lot of indicators are present at the planet level. Fixed missing Lotus VO in the ship crash cinematic of Vor’s Prize. Fixed VO issues with the primary weapon selection option in Vor’s Prize. Fixed issues with crouch text hint appearing too laggy if player stays in area. The Kubrow Start Kit and a full set of Kubrow Mods. Kubrows are no longer subject to permadeath if they die on a mission without a Collar. This fix was done serverside. Hotfix 14.0.2: (PSA: Header of Forums will be updated shortly, I know it still says 14.0.1). PSA: Still large quantity of 'can't progress' in Vor's Prize quest reports that are being actively attempted to fix as we speak. Fixed 'Confront Vor' phase of Vor's prize not being completable if player already had Mercury unlocked. Fixed players being stuck in Vor's Prize quest after completing the Comms Recovery tutorial mission, the navigation context action will never activate. Temporary fix for pausing game in Solo missions while hitting ESC. Fixed 2 crashes that would frequently occur frequently in Infested missions. Fixed potentially infinite Kubrow spawns on Earth after Host Migration. Fixed water textures looking far too reflective and blue. Fixed UI not showing amount of Void Keys (and Keys in general) in inventory or on Solar Map. Fixed ‘Sell all Duplicates’ Selling all Fusion Cores. Fixed 'foundry segment located' VO playing after it was picked up if player approached the segment when not looking directly at it. Fixed Nyx, Banshee, and Hyrdoid's toggle-able powers being broken by pause menu. Fixed Rhino Prime's Iron skin not being gold. Did not seem to work. Fixed issues with ESC menu UI being cropped at 4:3 aspect ratios. Fixed scrolling of mission rewards with Mouse Wheel. Fixed mission names getting cut-off in UI. Fixed Ordis Kubrow dialogue spam. Fixed 'owned' counter in Foundry not showing up. Fixed false 'you got an Egg!' lines in the Howl of the Kubrow quest when you had not received an egg. Fixed Dark Sector missions not being playable Solo. Fixed Platinum Coupons not showing up in store until relog. Fixed filtering of max ranked mods in mod collection screen. Fixed crafted Warframes requiring relog to receive ability mods. Fixed distance based transmission VO triggering after objective is complete. After completing the Comms Recovery tutorial mission players will be stuck in the ship after installing the market module, the navigation context action will never activate. Restarting the game will fix the progression. Added in a notification when receiving new Quests to improve visibility. Removed the ability to "moonwalk" while on the Liset, while we wanted to ensure people could travel quickly around their ship, we have replaced the jarring movement with a slide. Reduced the Morphic cost of the AkZani from 200 Morphics to 2. Altered the range of the visual effect of Mirage's Sleight of Hand ability. Reduced the amount of projectile visual effects seen when using specific weapons in conjunction with Mirage's Hall of Mirror clones. Removed the visual feedback seen when installing/uninstalling a Mod in the Arsenal screen. Restored the Quit Game button in the login screen. Tweaked the Mission Countdown sound effect. Players can now collect an Extractor that has been deployed on a sector that has become locked. The Clan Management screen will now automatically appear when selecting the Dojo from the Solar Map. This should fix issues with navigating to your Dojo from the new Navigation menu. Altered the visual effects on the Silva & Aegis after casting an Ability. Change the ordering of tabs in the Chat window so as to prevent automatic joining of Region chat. Adjusted the join parameters on Council chat so as to help improve performance. Adjusted the difficulty of the Mercury Vor encounter so as to provide players who are decked out in high level gear with more of a challenge. Fixed an issue with some players not receiving the Vor's Prize blueprint correctly. We have put in measures to help with players that are currently ‘stuck’, which should allow progression to continue once you receive this hotfix. If this is not the case, please let us know in this thread or a support.warframe.com ticket. Fixed missions in Vor’s Prize allowing multiplayer sessions causing problems with quest progression. Fixed an Ancient Infested animation related crash. Fixed issue where players would see a 60,000 second countdown for missions. Potential fix for matchmaking sessions that have more than 4 players connected. Fixed issue where you could remain trapped in the Vay Hek boss room. Fixed incorrect polarity on Silva and Aegis Stance Mod, “Eleventh Storm”. Fixed some backwards phrasing in the Skip Prologue text strings. Fixed a column and scroll bar arrangement issue in the Stats screen. Fixed an issue with input being accepted during certain cinematics. Fixed the visual effects when hovering over the Extractor deploy button. Fixed a lighting issue seen in the Shipyards tilesets. Fixed an issue with Vor being killable during the Prologue tutorial. Fixed an issue with the Offline Segment UI element clipping into ship geometry. Fixed an issue with Sector selections being registered as double clicks when on the Solar Map. Fixed an issue with the Codex not being properly accessible after installing the Comms Segment. Fixed an issue with enemy AI in the tutorial not properly keeping up with the player as they progress through. Fixed an issue with Valkyr's Hysteria not properly respecting the level of the associated Stance, making combos unusable. Fixed the Melee Combo menu not properly showing the Stance level and showing combos as locked when they aren't. Fixed an issue with Eos armor set channeling effects not being seen in game correctly. Fixed an issue with the Mod icons appearing incorrectly after having viewed the Stats screen. Fixed an animation issue with the Kubrow diorama. Fixed an issue with Chat Tabs breaking when creating a new tab. Fixed an issue with the wrong mission type being displayed in the Alert info panel. Fixed an issue with the camera being very blurry when activating the Foundry. Fixed a number of power in use and loss of functionality issues related to Mirage's Sleight of Hand ability. Fixed an issue with Liset sounds not playing during loading screens. Fixed floating waypoints and markers that occurred after death. Fixed issue where UI becomes slow and unresponsive after backing out of a store submenu in which the list was scrolled. Tenno, to help us work through the kinks of our most ambitious Update yet, please see the following message to help streamline the issue identification and feature fixing process. We will be standing by as long as humanly possible to resolve issues as they appear. Introducing: Ordis! The Liset’s Cephalon - voice and guide! This new character exists as the Liset’s original operating system, and is finally functional and ready to serve the Tenno after hundreds of years of abandon. Battle Pay is now proportionate to your contributions to the mission. For the new game mode, Attackers have to destroy the "core", and defenders have to prevent that. The more damage you do (or prevent, as appropriate), the more you get paid. Silva & Aegis: This fiery sword and shield combination perfects the balance of Tenno offense and defense prowess. In the hands of a Master, even a defensive tool like a shield can be used as a deadly weapon. This new weapon uses a brand new Stance, 'Eleventh Storm'! Created from the concept of our Melee Design Contest winner: SilverBones. All Ancients - better anticipation of knockdown attack. It can now be parried to nullify damage and the knockdown. Toxic Ancients - Do poison damage and gives all nearby enemies poison damage. Ancient and nearby enemies are resistant to poison and gas damage. Healing Ancients - Links with nearby allies, any damage they take heals the Ancient up to 150% health, and it scales up to reflect having health > 100%. Also reduces damage that nearby allies take. Disruptor Ancients - Aura that reduces radial and power damage taken by nearby allies. Attack damage energy, rather than completely drain it. Attacks of nearby allies have the same effect. The 'stacking' bug was fixed, capsules don't spawn instantly on activating a capsule if the level is full. The first room's capsule spawns are no longer switched off after one use. Since the first room is reused, each level may now have 2-3 more simultaneous capsules active before it reaches capacity. Originally the level structure was a little different, disabling spawns was intended to keep players closer to extraction after moving on from the first room. Optimized game memory to improve stability for 32-bit systems and reduce load-times. This optimization includes up to ⅓ less data being loaded on boot. Removed blood/dismembered Grineer from Excalibur's codex entry ...he didn't mean to hurt anyone. Loki Prime's decoy now holds a Lex Prime! Improved the cast sound effect for Loki's Radial Disarm ability. Player's can no longer be staggered when quick Meleeing with the Glaive. Polished some of Tyl Regor's animations. Improved the visuals on Mag's Pull ability. Loki's Decoy ability deploy sound effect is now positional and will not be heard by players past a certain distance. Increased the volume of Vauban's power cast sound effects. Improved the performance of Ash's Smoke Screen on lower end PC's. Fixed "Failed to send game invitation" that would occur if you invited to your game after opening up your contact list, and it was still collecting session information for your friends' games. Fixed a case in Nyx's Mind Control that could cause power-in-use on clients. Fixed an animation 'pop' that could be seen after performing a ground attack and attempting to roll. Fixed an issue with Client's sometimes taking and dealing double the intended amount of damage when using Weapons or Abilities that deal damage in a radius. Fixed an issue with Client's seeing the incorrect translations for Specter if the host is playing in a different language.